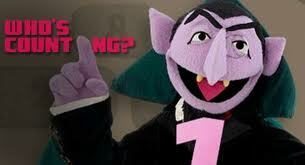 Devotees of the great sesame street will remember "The Count" and his numeracy song. Last night incorporated a visit at dusk to Stanhope to meet a bat survey team resplendent with not quite enough midgy protection nets to go round, prepared for a bat count. Good job the local police had been tipped off in advance as this sort of dress code in the half light might be misconstrued. In addition it is a good job that there has recently been a fast charge point installed just to the east of Durham City. Access to the very top of Weardale and back is now no problem. Excitingly the entrance to this new charge point is via a magnificently marked "Bus and electric vehicle only lane" which somehow makes me feel extra special .